A team of MIT researchers has used a novel material that’s just a few atoms thick to create devices that can harness or emit light. This proof-of-concept design could lead to ultrathin, lightweight, and flexible photovoltaic cells, light emitting diodes (LEDs), and other optoelectronic devices, the researchers say. The research was published in the March 9 issue of Nature Nanotechnology. 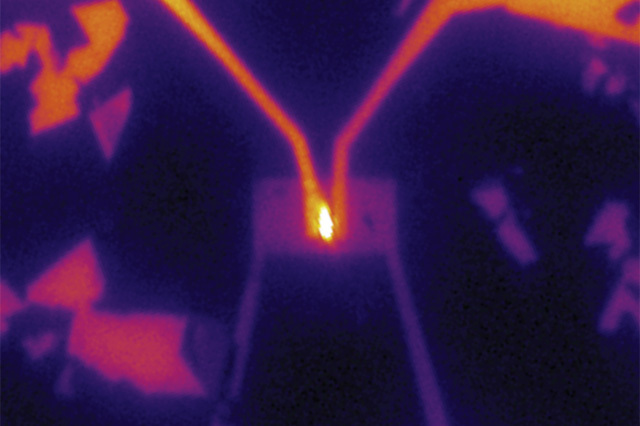 Researchers at Vienna University of Technology and the University of Washington also reported discovery of this material’s optoelectronics uses in this issue. Typically, diodes (which allow electrons to flow in only one direction) are made by “doping,” which is a process of injecting other atoms into the crystal structure of a material to create p-type or n-type semiconductors. But with the new material, either p-type or n-type functions can be obtained on the fly, just by bringing the vanishingly thin film into very close proximity with an adjacent metal electrode and tuning the voltage in this electrode from positive to negative. That means the material can easily and instantly be switched from one type to the other, which is rarely the case with conventional semiconductors. In their experiments, the MIT team produced a device with a sheet of WSe2 material that was electrically doped half n-type and half p-type, creating a working diode that has properties “very close to the ideal,” said Pablo Jarillo-Herrero, the Mitsui Career Development Associate Professor of Physics, who headed the research team. The p–n junction is the functional element of many electronic and optoelectronic devices, including diodes, bipolar transistors, photodetectors, light-emitting diodes and solar cells. In conventional p–n junctions, the adjacent p- and n-type regions of a semiconductor are formed by chemical doping. Ambipolar semiconductors, such as carbon nanotubes, nanowires and organic molecules, allow for p–n junctions to be configured and modified by electrostatic gating. This electrical control enables a single device to have multiple functionalities. Here, we report ambipolar monolayer WSe2 devices in which two local gates are used to define a p–n junction within the WSe2 sheet. With these electrically tunable p–n junctions, we demonstrate both p–n and n–p diodes with ideality factors better than 2. Under optical excitation, the diodes demonstrate a photodetection responsivity of 210 mA W–1 and photovoltaic power generation with a peak external quantum efficiency of 0.2%, promising values for a nearly transparent monolayer material in a lateral device geometry. Finally, we demonstrate a light-emitting diode based on monolayer WSe2. These devices provide a building block for ultrathin, flexible and nearly transparent optoelectronic and electronic applications based on ambipolar dichalcogenide materials. The limitations of the bulk semiconductors currently used in electronic devices — rigidity, heavy weight and high costs — have recently shifted the research efforts to two-dimensional atomic crystals such as graphene and atomically thin transition-metal dichalcogenides. These materials have the potential to be produced at low cost and in large areas, while maintaining high material quality. These properties, as well as their flexibility, make two-dimensional atomic crystals attractive for applications such as solar cells or display panels. The basic building blocks of optoelectronic devices are p–n junction diodes, but they have not yet been demonstrated in a two-dimensional material. Here, we report a p–n junction diode based on an electrostatically doped tungsten diselenide (WSe2) monolayer. We present applications as a photovoltaic solar cell, a photodiode and a light-emitting diode, and obtain light–power conversion and electroluminescence efficiencies of ~0.5% and ~0.1%, respectively. Given recent advances in the large-scale production of two-dimensional crystals, we expect them to profoundly impact future developments in solar, lighting and display technologies. The development of light-emitting diodes with improved efficiency, spectral properties, compactness and integrability is important for lighting, display, optical interconnect, logic and sensor applications. Monolayer transition-metal dichalcogenides have recently emerged as interesting candidates for optoelectronic applications due to their unique optical properties. Electroluminescence has already been observed from monolayer MoS2 devices. However, the electroluminescence efficiency was low and the linewidth broad due both to the poor optical quality of the MoS2 and to ineffective contacts. Here, we report electroluminescence from lateral p–n junctions in monolayer WSe2 induced electrostatically using a thin boron nitride support as a dielectric layer with multiple metal gates beneath. 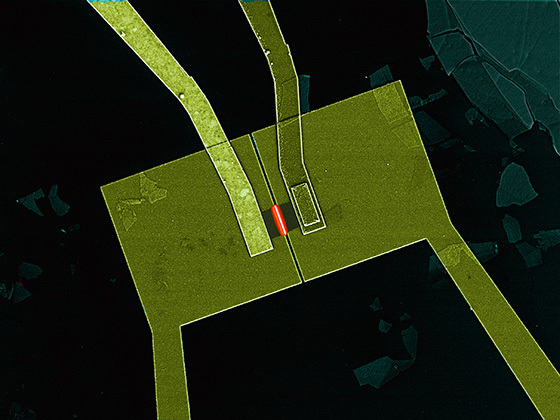 This structure allows effective injection of electrons and holes, and, combined with the high optical quality of WSe2, yields bright electroluminescence with 1,000 times smaller injection current and 10 times smaller linewidth than in MoS2. Furthermore, by increasing the injection bias we can tune the electroluminescence between regimes of impurity-bound, charged and neutral excitons. This system has the required ingredients for new types of optoelectronic device, such as spin- and valley-polarized light-emitting diodes, on-chip lasers and two-dimensional electro-optic modulators.